Secure, easy to use, critical for your business. The IP Phone 8851 delivers highly secure, easy-to-use, mission-critical, comprehensive VoIP communications with telephone features, that can be integrated with your personal mobile devices for your entire organization. With the IP Phone 8851, you can increase personal productivity through an engaging user experience that is both powerful and easy-to-use. 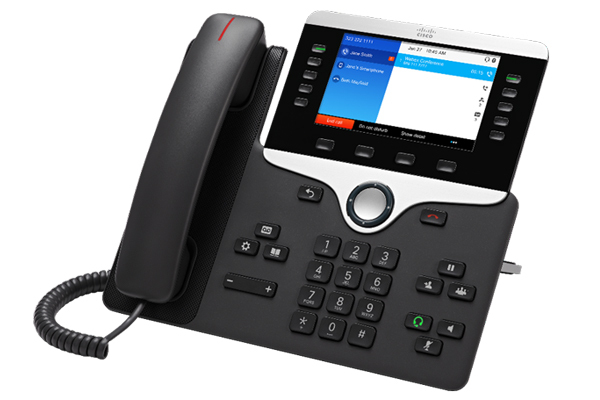 The IP Phone 8851 combines an attractive new ergonomic design with wideband audio for crystal clear voice communications, “always-on” reliability, encrypted voice communications to enhance security, and access to a comprehensive suite of unified communications features. The Cisco IP Phone 8851 offers a 5-in. high-resolution (800 x 480) widescreen VGA backlit colour display. Localized language support, including right-to-left on-screen text, meeting the needs of global users. The phone offers a built-in Gigabit Ethernet switch for both network connection and your PC connection. Support for Cisco EnergyWise™ technology makes the Cisco IP Phone 8851 more energy-efficient and eco-friendly; the phone is recognized as environmentally friendly by the Energy Star organization. An optional wall-mount kit is orderable as an additional feature for customers seeking this capability. Up to three optional IP Phone 8800 Key Expansion Modules can be supported for 108 additional line and feature keys. Charcoal and white colour options. ● The phone offers an easy-to-use interface and provides a traditional telephone-like user experience. ● The handset is a standard wideband-capable audio handset (connects through an RJ-9 port). ● The standard coiled cord has a custom end for concealed cable routing beneath the phone (cord length is approximately 21 in. [55 cm] coiled and up to 72 inches. (183 cm) extended). ● The handset is hearing aid-compatible (HAC) and meets Federal Communications Commission (FCC) volume requirements for the Americans with Disabilities Act (ADA). You can achieve Section 508 loudness requirements by using industry-standard inline handset amplifiers such as Walker Equipment W-10 or CE-100 amplifiers. The dial pad is also ADA-compliant. ● The full-duplex speakerphone gives you flexibility in placing and receiving calls with hands free. For added security, the audible dual tone multifrequency (DTMF) tones are masked when the speakerphone mode is used. ● The analog headset jack is a standard wideband-capable RJ-9 audio port. ● You can use an auxiliary port to support electronic hookswitch control with a third-party headset connected to it. ● The phone has a 3.5-mm stereo line in/out jack (for optional external headset, speakers, or headphones). ● Two USB ports enhance the usability of call handling by enabling wired or wireless headsets, as well as provide charging capability to mobile devices such as smartphones or tablets. ● A side USB port provides up to 500mA power output at 5V or 2.5W. ● A back USB (in yellow) port provides 500mA power output and is upgradeable to support up to 2.1A power output at 5V or 10.5W. ● An internal 2-port Cisco Ethernet switch allows for a direct connection to a 10/100/1000BASE-T Ethernet network (IEEE 802.3i/802.3u/802.3ab) through a RJ-45 interface with single LAN connectivity for both the phone and a co-located PC. ● The system administrator can designate separate VLANs (IEEE 802.1Q) for the PC and phone, providing improved security and reliability of voice and data traffic. ● The phone offers Bluetooth 3.0 Enhanced Data Rate (EDR) Class 1 technology (up to 66-ft [20m] range). ● Hands-Free Profile (HFP) is supported for untethered headset connections and voice communications. ● Phone Book Access Profile (PBAP) is supported for phone book object exchange between devices. ● The phone supports backlit indicators for the audio path keys (handset, headset, and speakerphone), select key, line keys, and message waiting. ● The phone includes a black bezel; an optional silver bezel is also orderable separately. ● The display is easy-to-view and the buttons and keys are easy-to-use. The two-position foot stand supports viewing angles of 35 and 50 degrees; you can remove the foot stand for wall mounting, with mounting holes located on the base of the phone. ● You can install the phone on a wall using an optional wall-mount kit (orderable separately). ● The phone supports up to three KEMs to expand from 5- to 113-line buttons. You have the convenience of many speed dials or programmable features. ● The phone is compatible with the Kensington Security Slot (K-Slot) anti-theft system and is considered very secure.